Looking for remedy from that tingling pain or numbness in nerves? NeuropAWAY Nerve Support Formula is a dietary supplement by Vaso Corp that helps you to maintain healthy nerves function without any side effects. Here is our detailed NeuropAWAY review. What is NeuropAWAY Nerve Support Formula? The nervous system handles the way we move and function. Almost 20 million Americans suffer from peripheral nerve damage and up to 70% of people with diabetes deal with nerve damage. Nutritional deficiencies, diabetes, side effects of prescription drugs or exposure to toxic chemicals can weaken the nerves and cause nerve damage. People who suffer from diabetes tend to suffer from nerve damage which becomes threatening as the disease progresses. Diabetic neuropathy is a serious complication that affects the neurons. A patent pending formula, NeuropAWAY enhances the blood circulation to the nerves that require immediate attention and boost the conduction velocity. As per manufacturer’s claims, it is the only dietary supplement that contains this patent-pending formula. Methylcobalamin (vitamin B12) 240mcg – often regarded as painkilling vitamin, studies show that vitamin B12 plays a key role in proper brain and nervous system. Taurine – acts as a neurotransmitter that calms the nervous system. Taurine deficiency can lead to anxiety (usually seen in vegan diets). Acetyl-L-carnitine – is known for its nerve regenerative quality. It serves as a neuroprotective agent when it comes to peripheral neuropathy. L-Citrulline – improves the blood flow to the nerves and other vital organs of the body. B-Alanine – increases the carnosine levels that is necessary to keep your energy levels up. Meaning, less carnosine you have, quicker you will experience fatigue or lethargic. Low levels of carnosine can make you feel like you have lost strength, speed or ability to quickly fire up your muscles. R-Alpha-lipoic acid – research has it that consuming 600-1200 mg daily for three weeks can alleviate symptoms of diabetes neuropathy. Dosage – How to use NeuropAWAY? The recommended NeuropAway dosage is 2-6 capsules a day. However, for faster results, you may take up to 4-6 capsules for the first five days and then go back to a lower dose. However, we recommend talking to your physician and working out a plan for optimum results. You can choose from two options – Regular and Economy. One bottle of Regular NeuropAWAY Nerve Support Formula comes with 60 capsules and Economy contains 120 capsules. Economy is the better option as it gives you more quantity at an affordable price. If you are using it for a prolonged period, this is best recommended. If you are pregnant or nursing, consult your medical practitioner first. For those who are taking prescription drugs for diabetes or any nerve condition, consult your medical practitioner first and then start NeuropAWAY Nerve Support Formula. This is to avoid any interference with your current medication. So far, there have been no side effects of NeuropAWAY. The ingredients are all-natural and works unanimously in delivers results to the body. NeuropAWAY review – What do users say? People report relief from symptoms of nerve pain such as tingling sensation, numbness, diabetic nerve pain, burning under the bottom of feet and so on. Users who have been dealing with nerve pain conditions for years have got profound relief from NeuropAWAY. There are few complaints as well. Few users claim that the NeuropAWAY did not result in any difference in their current health condition and they still feel the same. “Outstanding results. My mother is a formal dental hygienist and has been suffering from years of nerve damage. I got this product in hopes that it would relieve some discomfort. Where to buy NeuropAWAY Nerve support formula? NeuropAWAY is available online at various websites such as Amazon and OTC stores such as Walmart, Walgreens, CVS, and Target. 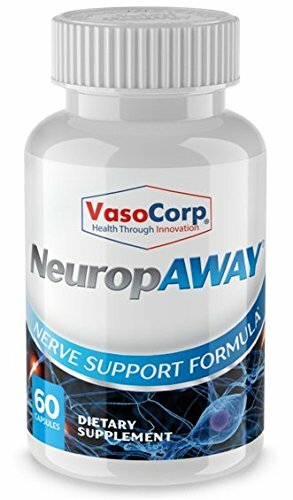 You can buy from the official website of Vaso Corp as well and avail of many discount codes, promo deals or a free sample for NeuropAWAY Nerve Support Formula. The company offers 30-day money-back guarantee on all their products including NeuropAWAY. If you don’t see any results and want to return, simply visit your nearest pharmacy or ship the product after initiating “return” on the official website. You will be reimbursed accordingly (minus the shipping charges). A patent-pending formula, NeuropAWAY is certainly a supplement that seems to help people fight nerve symptoms and its related conditions. We are a bit concerned about the higher dosage but it seems to have worked without triggering any side effects which is great. This certainly shows the quality infused in NeuropAWAY. That being said, we are confident NeuropAWAY is definitely worth a try. The product is remarkable. Recommend it 100% for everyone. Born with a positive streak, I love to see the positive side than crib about negative...A true Gemini, I love to explore a new culture, travel a lot and have a penchant for music. My motto - Life is too short to have bad moods. My current passion is to write, especially about health as what better way to live life than have a good health and a positive mindset!!! Best Life Supplements Copyright © 2019.